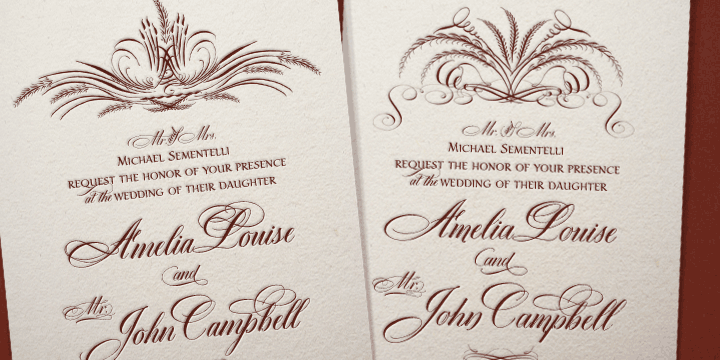 It never gets old to see my font used on something so sweet! I’m busy at work designing a new font, but in the meantime, you can check out my current two calligraphy fonts here. Belluccia has remained on the Best Sellers list for 19 months was named one of Myfonts Most Popular Fonts for 2011 and is available at myfonts.com. My second calligraphy font, Dom Loves Mary (a “December Rising Star” and 2012 Best Seller) is also available on myfonts.com. 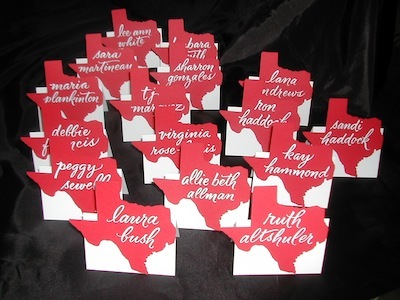 I had the pleasure of hand lettering these place cards for a luncheon hosted by The American Heart Association on Friday, February 1. It was to celebrate their “Go Red for Women” campaign. The keynote speaker was former first lady, Laura Bush. Also attending were some of Dallas’s loveliest ladies! Go Red For Women® celebrates the energy, passion and power we have as women to band together to wipe out heart disease and stroke. Thanks for helping women get healthy! 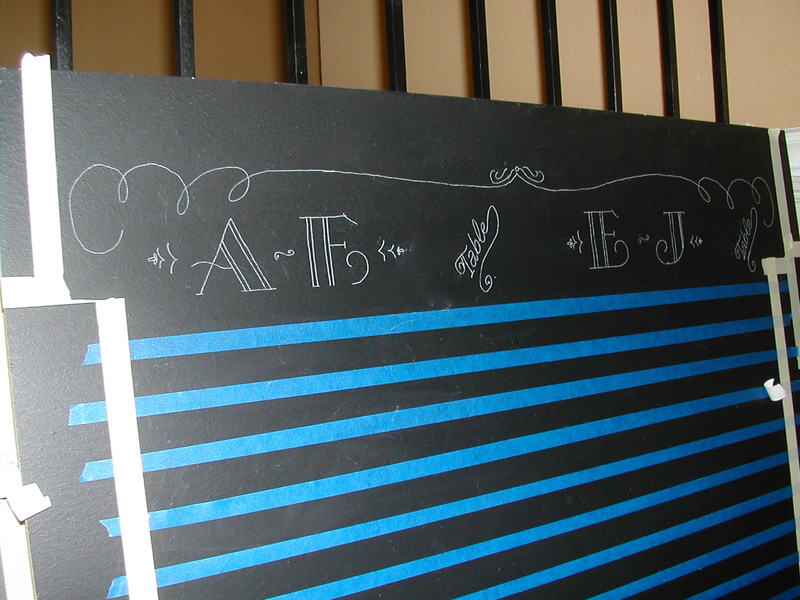 Chalkboard seating charts are very popular right now. So I thought I’d share some I just completed and explain the process for those who’d like to DIY it. It all starts with preparation. For this project, there were actually 3 boards approximately 6′ x 3′. You can purchase plywood at Loew’s or Home Depot and have them cut them to the size you need. The chalkboard paint for this project came from Loew’s. It’s made by Valspar. The first step is measuring the space you have, allowing for room on the sides (these fit into custom made holders) and figuring out the height of the lettering and the spaces in between names as well as the space needed to accommodate two columns if needed. 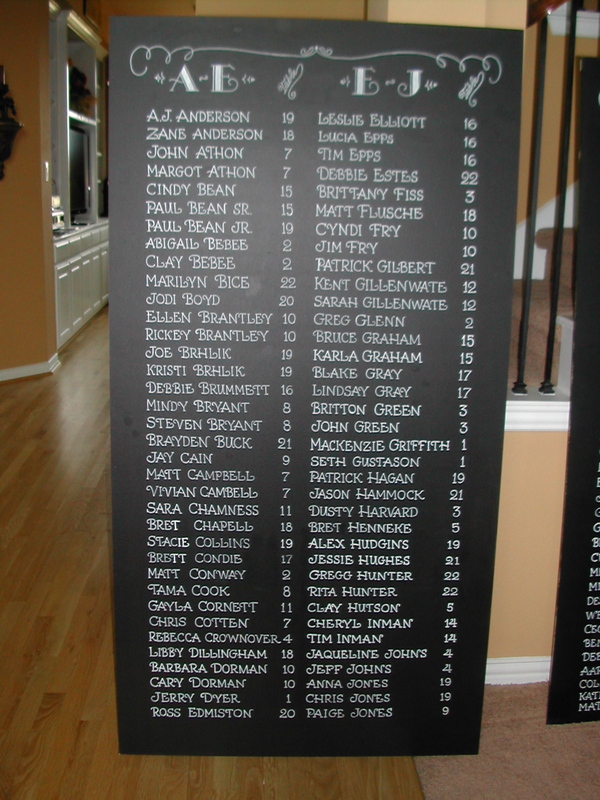 For these boards, there were 216 names. The size for each name was 1″ and the spaces in between were .5″. Next I designed the headers. Here’s a pic of one laid out on my light table. If you are not a lettering artist, you can use a font. Just size it on your computer, print it out and trace it on the board. You can do the same with flourishes. 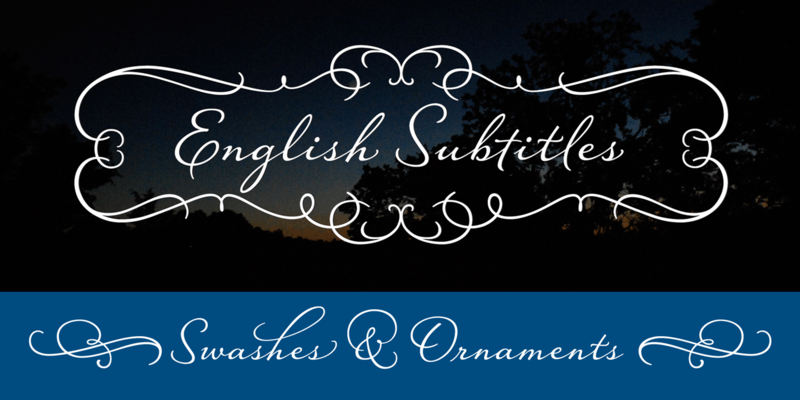 My Belluccia and Dom Loves Mary fonts can be used if you want a script font. Both also have flourishing packages you can purchase separately as well if you want to combine with a font you already have. 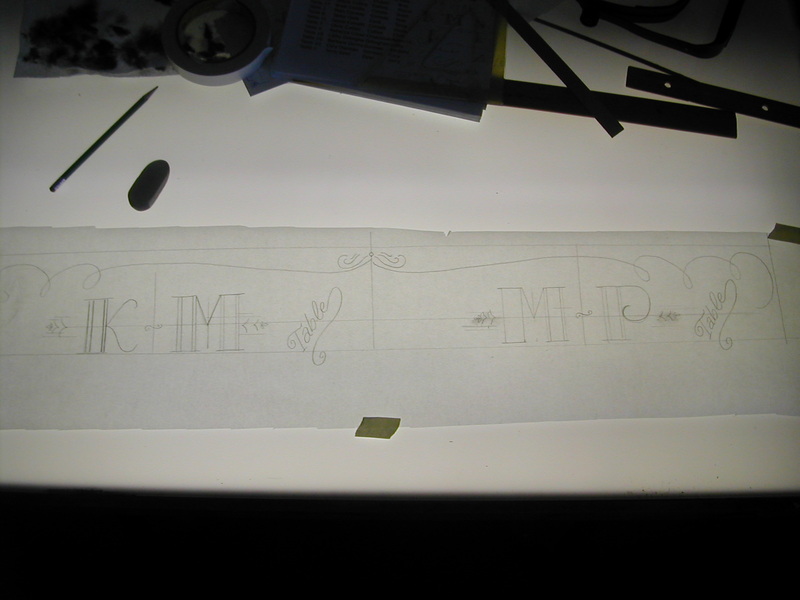 The header is transferred onto the chalkboard with transfer paper in white. This can be purchased at any craft store. You can see in the pic that I created the lines and spaces using painters tape that I cut to be .5″. This eliminates the need to erase lines as you will also spread the chalk marker paint as you erase. Note: Try to find .5″ tape, masking or painter’s tape, to save time. I found it after the fact at Uline.com. I did not find it at any local stores. 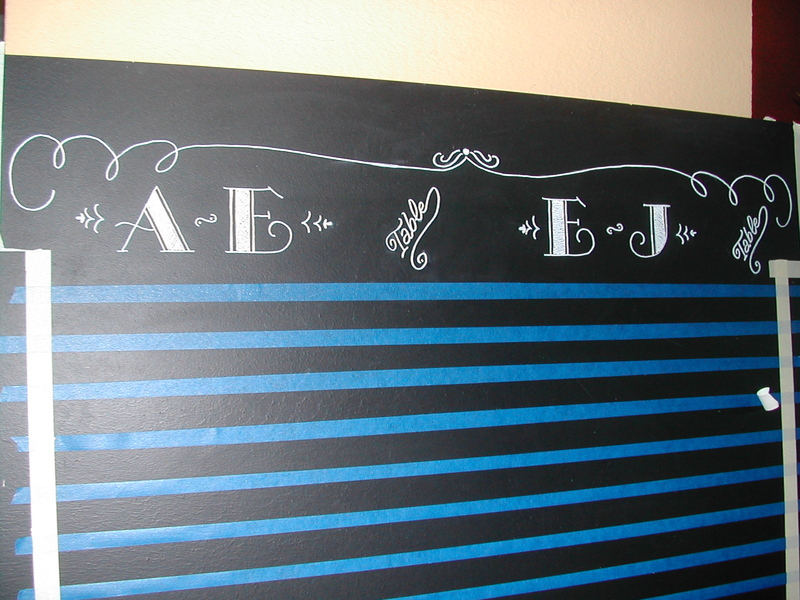 You can then go over the flourish and letters with a chalkboard paint marker. The one I used was called “Bistro Chalk Marker”. It’s made by Marvy and can be found in single colors at Hobby Lobby. If you make a mistake, be sure to wipe it off right away. It says that it comes off when you want but that wasn’t my experience. But if you wait too long and need to paint over to re-do it, be sure to wipe off as much as you can with a wet rag or else it will bleed into the paint. A note to remember…if you are going to do the list alphabetically you are limited on making any last minute additions or changes. I would suggest, unless you are totally sure about your guest list, to list by tables. Even if you have to paint over a name, you have more flexibility. 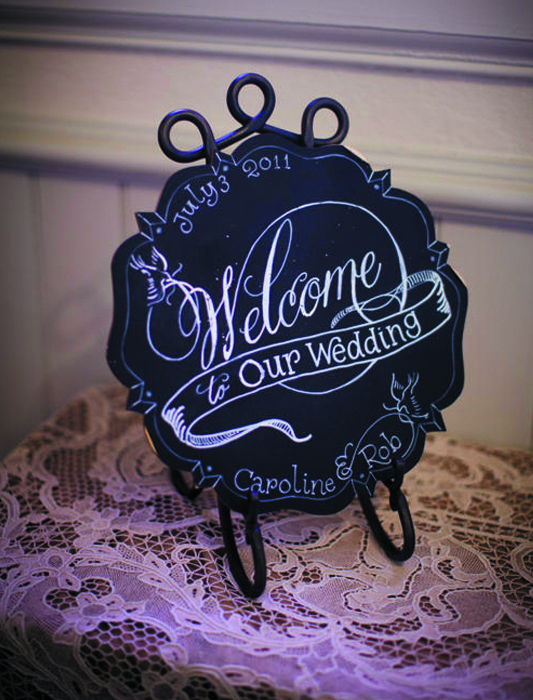 Here’s a pic of a small Chalkboard Welcome sign I did for a previous client using my Belluccia font, flourishes and ornaments. You can also check out more signs from these previous DIY Chalkboard posts here , here and here! 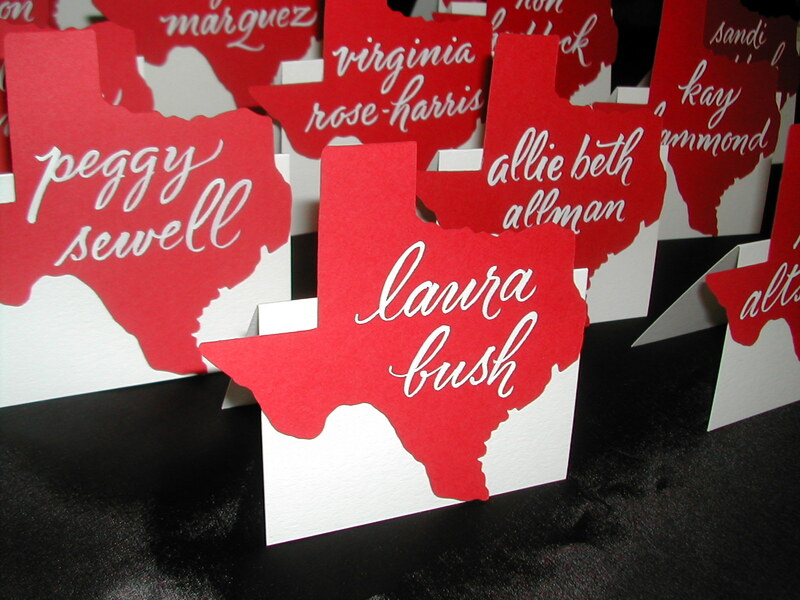 I created this personalized stationary for a client who was giving it to her sister as a Christmas/Wedding gift. She gave me separate pictures of the couple and their three pets. 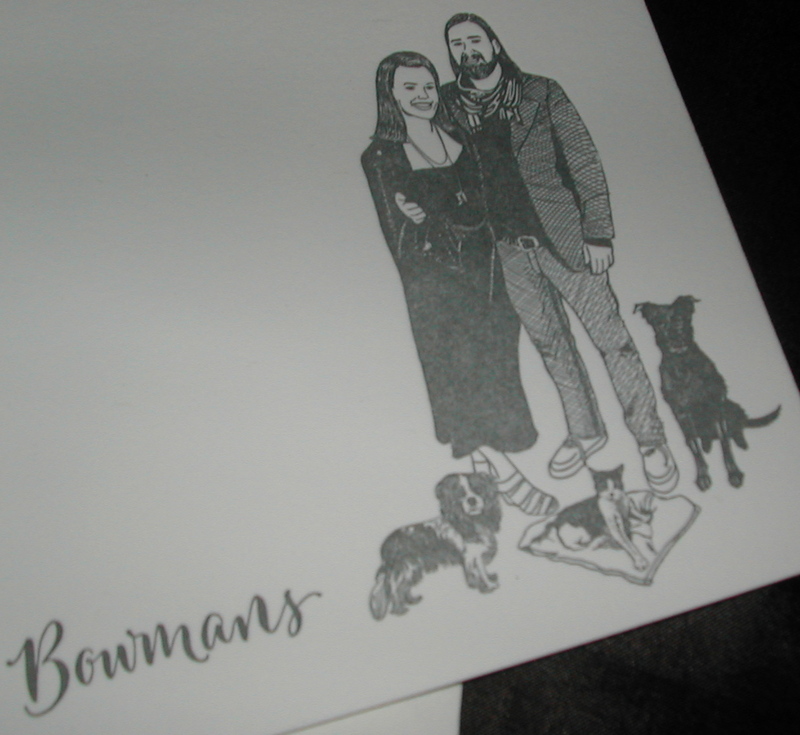 I created a black and white drawing of the couple and each of their “children”, arranged them together then added the hand lettered last name. I also created a return address for the envelope. I handed over the digital file to the very capable hands of letterpress printer, Travis Friedrich of ParkLifePress.com. 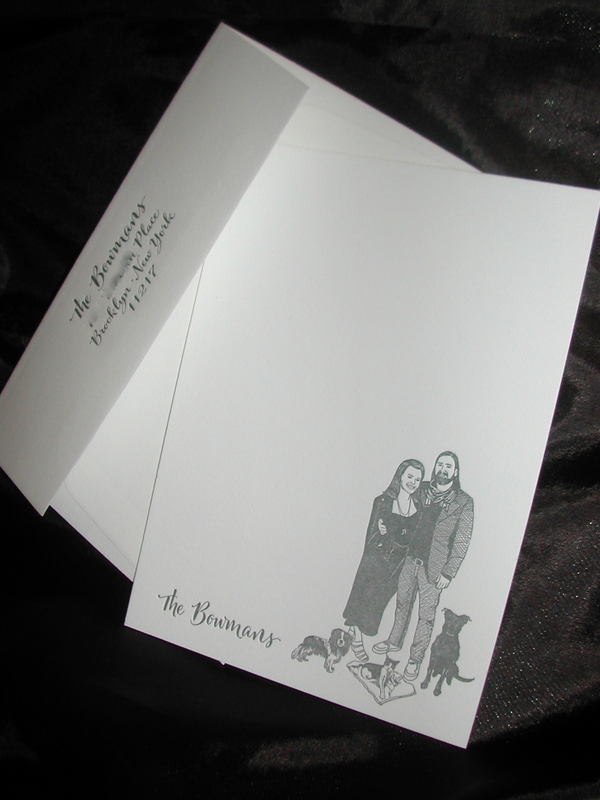 He printed in a soft gray on a luxurious 100% cotton paper at 6.25″ by 4.5″ wide. This was the second project I’ve done with Travis and both were perfection! And his pricing is very reasonable. I hope the Bowmans were as pleased with the result as the gift giver was! I love the crisp look of black and white! 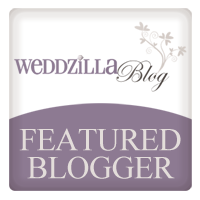 And I was thrilled to see my Belluccia calligraphy font was chosen to add to this couple’s classic look on Snippet & Ink’s blog. 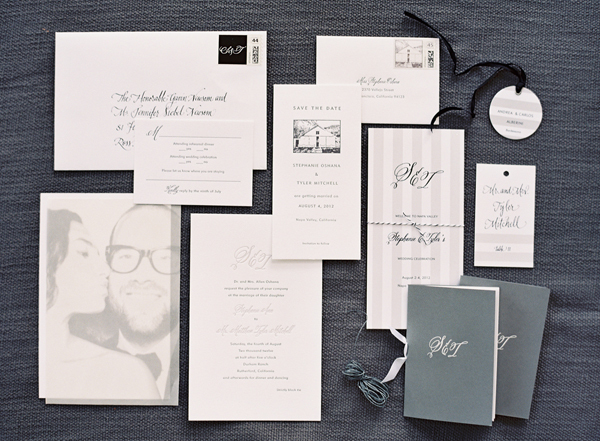 It’s used on the Rehearsal dinner invite ( love the gray stripes in the background), Wedding invitation, RSVP and return envelope, as well as the program and favor bags seen in the last pic below. 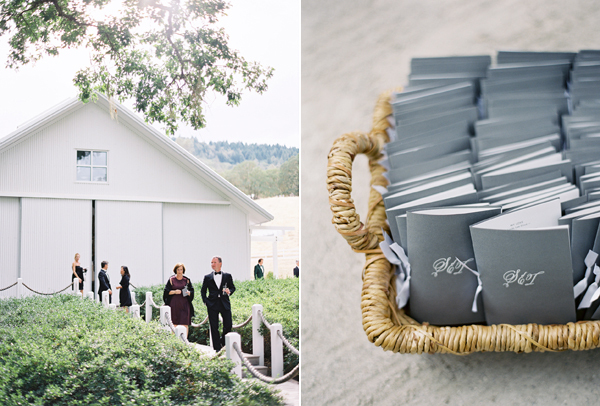 The gray programs pop with the couples white initials and ribbon. 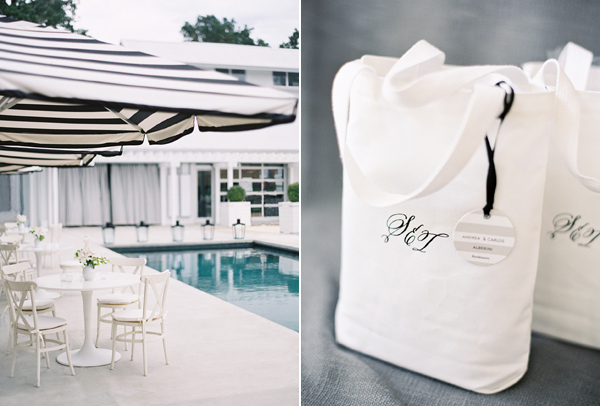 How darling are these monogrammed totes for the guests favors. I wonder what’s inside??? If you want to check out the whole shabang…go here. If you want to create the same look, below are links to purchase my Belluccia font as well as my newest calligraphy font, Dom Loves Mary. I’m excited to share this newly released calligraphy font, Slapjack, created by the fabulously talented Stephen Rapp. I’m a HUGE fan of his work! Slapstick has a very versatile look. 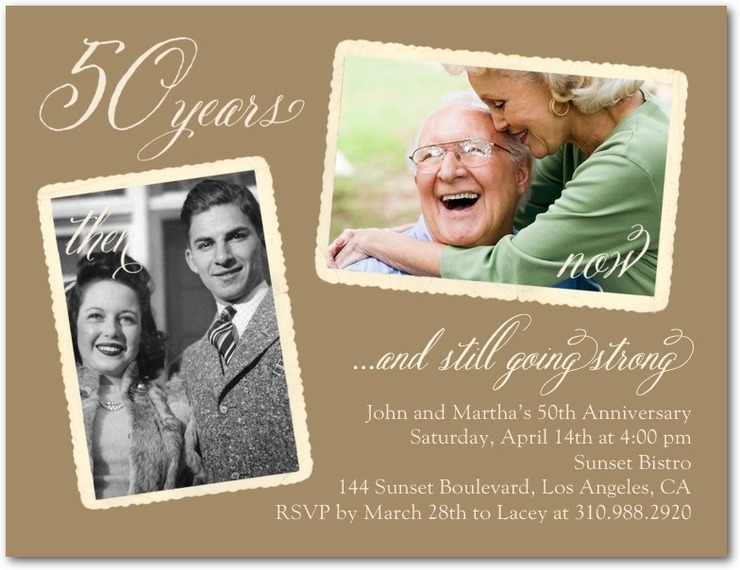 It would look beautiful on an invitation for a wedding or other event. Or be a perfect fit for a logo or retail packaging. I could definitely see this on a wine label. I am in love with that “h” !! And he did an incredible job with the all caps look. Clear and readable yet stylish. 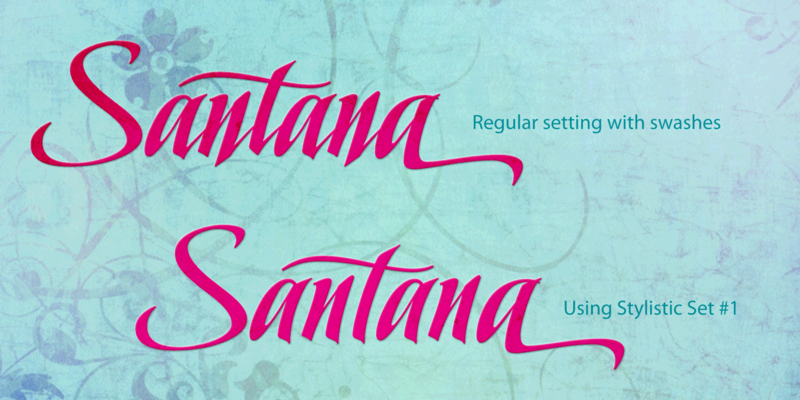 Here’s a little more about this versatile font. Slapjack is a unique rendition of a broad-edged calligraphic script ideal for packaging, signage, and titling. 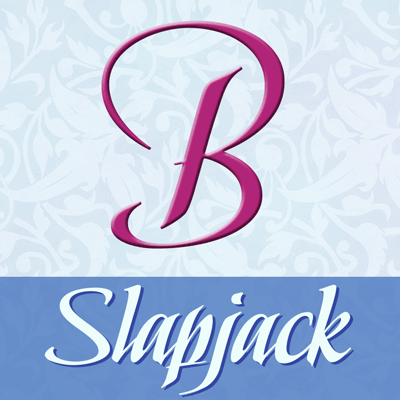 With a glyph count well over 700, Slapjack is a fully-featured pro font. Using Adobe InDesign which supports Stylistic Sets allows you to instantly convert your text to a version without baseline connectors for a more streamlined look. These can also be selected via the glyph palette. It’s so cool how you can choose to have a connected or non-connected look. It really changes the feel. I had the pleasure of meeting Stephen in person and found him to be extremely humble for such a talented lettering artist as well as a truly kind hearted and gentle man. I think his work beautifully represents those qualities. Here’s a few samples of some of his other gorgeous fonts. Hiatus is 30% off for a limited time! 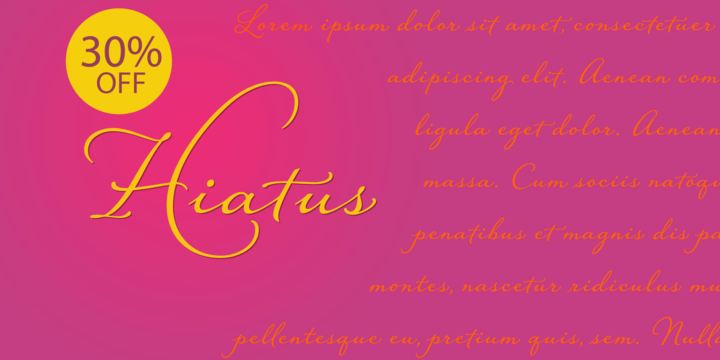 This graphic shows off the gorgeous flourishes in Hiatus. This historic look of Memoir has the look of beautiful handwriting. These Memoir ligatures are perfect for envelope addressing. 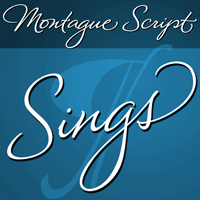 Montague Script is another font that has a lot of versatility. 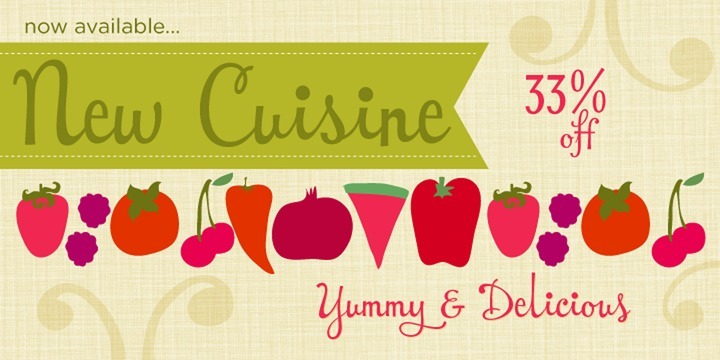 New Cuisine is one of my personal favorites and is 33% off for a limited time! Love the modern yet slightly retro look. There are too many fab fonts to show here so be sure to check out his full collection on myfonts.com. Lettering and typography are his passion. He’s studied and practiced lettering and type design for over 2 decades. He was a recipient of the Hermann Zapf Scholarship Award in 1997 and has been a lettering artist and type developer for American Greetings since 2000. Published in Letter Arts Review, Scripsit, Bound and Lettered, the recently released “Modern Mark Making” by Quarry books, and Typography 30 by The Type Directors Club. He has taught classes and workshops on both calligraphy and lettering and has been a faculty member at the International Lettering Arts Conference and Typecon. In addition to his work with American Greetings, Stephen designs commercially available fonts for P22, Veer, and MyFonts. I’m delighted to know such a great designer and human being. 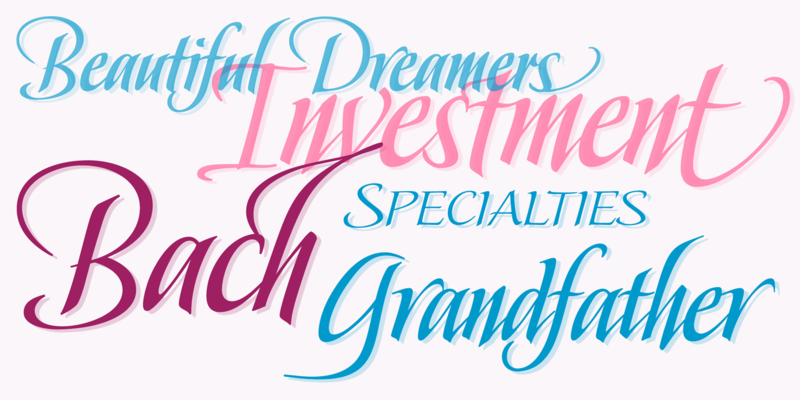 My two calligraphy fonts, Belluccia and Dom Loves Mary (both “Rising Stars” and Best Sellers on myfonts !) are always available on myfonts.com. The Dom Loves Mary script font, recognized as a “Rising Star” for December 2012 is available at myfonts.com. My first cursive font, Belluccia has remained on the Best Sellers list for 19 months was named one of Myfonts Most Popular Fonts for 2011 and is available at myfonts.com. I was thrilled to once again do calligraphy addressing of these envelopes for my clients darling photo Christmas cards. The photography and card design are by the very talented Angela Weedon of Angela Weedon Photography. I love lettering in white on a color. It just looks so fresh! 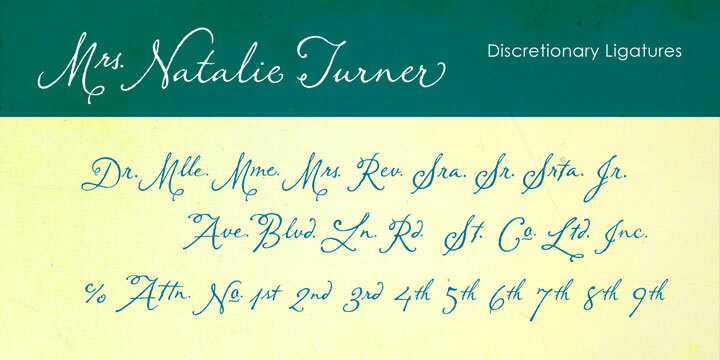 By the way, did you know that you can use my calligraphy fonts to address your own envelopes? That’s one of the reasons I created them. To give people who love calligraphy, the ability to use it for their own projects. I’m still getting back into “work mode” after having a lovely holiday with both of my sons at home and lots of fun visits from friends and family. One big announcement for the new year…I’m finally opening an Etsy Shop! I will start selling my fonts there. We’ll see what else evolves. I have plans to release at least 2 more fonts this year. Of course you’ll hear all about it as they progress. In the meantime, here’s the links to my first two calligraphy fonts. I’m thrilled that they are both still on the Best Seller’s list! The Dom Loves Mary font, recognized as a “Rising Star” for December 2012 and currently on the Best Sellers List, is available at myfonts.com. 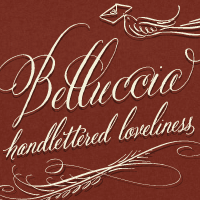 Belluccia has remained on the Best Sellers list for 19 months was named one of Myfonts Most Popular Fonts for 2011. These wine glasses with custom calligraphy were given as gifts by my client. Now that the holiday is over, I can finally share pics with you. The bottoms were painted in yellow and black. The word “believe” ( get it “bee”-lieve:) was hand lettered on the body of the glass. I hope the ladies liked their gifts! Looking for a calligraphy font? Take a look at mine: Just click on the pics below to be taken to my cursive font page. The Dom Loves Mary font, recognized as a “Rising Star” for December 2012 and currently on the Best Sellers List , is available at myfonts.com. Since I know these have now been mailed, I can finally show you a custom retro Christmas card I designed for one of my sweetest clients. The client ordered the cards and envelopes with liners online from www.cardsandpockets.com and had them shipped to my studio. This allowed me to match the colors. I have to say, the quality of the cards and envelopes was very good for the price. They wanted a retro look created with all hand lettering. My favorite! The lettering and other design elements were created by hand using a round brush and gouache paint. It was scanned into the computer and placed in the card designed in Photoshop. They were printed on white 6″ x 6″ folded cards. Since they live up north, adding some snow was a must! Next I’ll be creating cards for a Holiday Card exchange. Need to get those out by Dec. 12. Better get back to work! My first cursive font, Belluccia is available at myfonts.com . 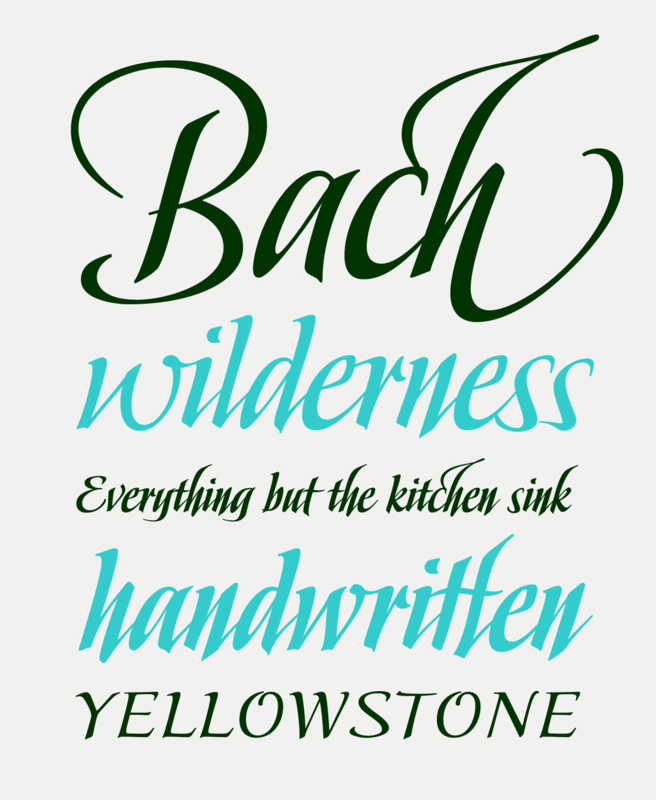 Belluccia has remained on the Best Sellers list for 18 months was named one of Myfonts Most Popular Fonts for 2011. I was creating some samples for a potential client and thought I’d share these Table Numbers and Place Cards in my calligraphy fonts. In the pic above I used my cursive font, Dom Loves Mary Stylistic version. The flourish on the capital T was created using a flourish from the Dom Loves Mary Flourishes Two set. 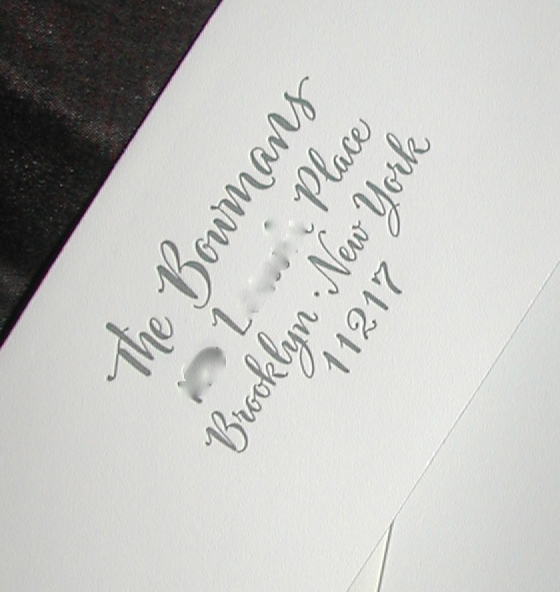 I used Dom Loves Mary text font for “TABLE 12” on the place card. And in this pic, I’ve used my Belluccia font and Borders. Here’s an example using Hand lettering. Using a Calligraphy font gives you the beautiful look of hand lettering at a fraction of the cost. That’s why I created them! With either Belluccia or Dom Loves Mary, you can easily design all of your event signage and print off your own computer. 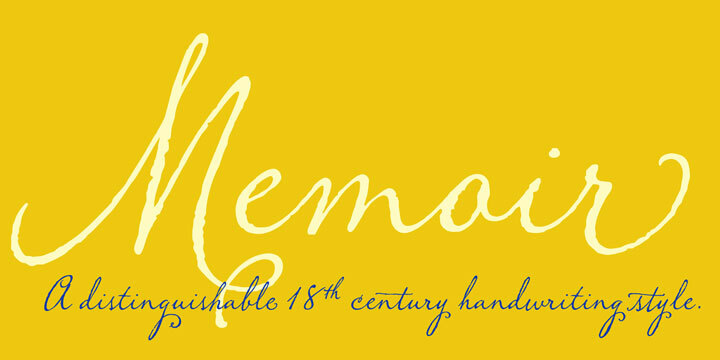 My first cursive font, Belluccia is available at myfonts.com. Lettering Art Studio has moved! Lettering Art Studio New Website Launched!